BACKGROUND AND PURPOSE: Recent research has suggested the importance of plaque composition to identify patients at risk for stroke. 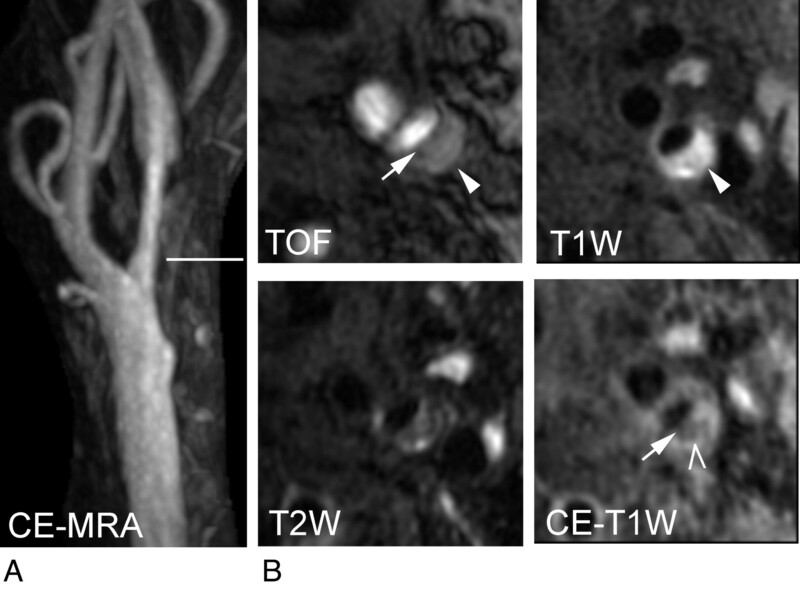 This study aims to identify specific plaque features on 3T carotid MR imaging and CE-MRA associated with recent carotid thromboembolic symptoms in patients with mild/moderate versus severe stenosis. MATERIALS AND METHODS: Ninety-seven consecutive patients (symptomatic, 13; asymptomatic, 84) with 50%–99% stenosis by sonography or CT angiography underwent carotid plaque imaging combined with MRA at 3T. The symptomatic carotid artery or the most stenotic asymptomatic carotid artery was chosen as the index vessel to be analyzed. Plaque features were compared by symptomatic status in patients with mild/moderate (30%–70%) versus severe (70%–99%) stenosis on MRA. RESULTS: Ninety (92.8%) patients had sufficient image quality for interpretation. In 50 patients with mild/moderate stenosis, there were significant associations between the presence of the following plaque characteristics and symptoms: thin/ruptured fibrous cap (100% versus 36%, P = .006) and lipid-rich necrotic core (100% versus 39%, P = .022), with marginal association with hemorrhage (86% versus 33%, P = .055). In 40 patients with severe stenosis, only the angiographic presence of ulceration (86% versus 36%, P = .039) was associated with symptoms. CONCLUSIONS: Several plaque components identified on 3T MR imaging are correlated with recent ipsilateral carotid thromboembolic symptoms. These preliminary results also suggest that associations between plaque characteristics and symptom history may vary by degree of stenosis. If confirmed in larger studies, carotid MR imaging may distinguish stable from unstable lesions, particularly in individuals with mild/moderate stenosis in whom the role of surgical intervention is currently unclear. Stroke is a leading cause of long-term disability and the third most common cause of mortality in the UnitedStates.1,2 Large randomized trials such as the NASCET or the European Carotid Surgery Trial have shown the benefit of CEA for recently symptomatic patients with severe (≥70%) stenosis. The optimal treatment strategy in symptomatic patients with mild/moderate (30%–70%) carotid stenosis or in asymptomatic patients, however, remains unclear. For example, additional evaluation of the NASCET data found that of the 2226 symptomatic subjects with <70% stenosis, 61% had <50% stenosis.3 The role of CEA in asymptomatic individuals is also still much debated in light of the results of the Asymptomatic Carotid Atherosclerosis Study4 and the Asymptomatic Carotid Surgery Trial.5 Various interpretations of these 2 studies have lead to discrepant recommendations of optimal treatment strategies. To investigate the potential differences in carotid plaque characteristics, several studies have compared the histology of carotid plaques removed from symptomatic and asymptomatic patients who have undergone CEA. In a summation analysis of 7 such studies in which CEA specimens were removed from symptomatic and asymptomatic patients with equal severity of stenosis, Golledge et al6 reported that histologic features of surface ulceration and plaque rupture along with fibrous cap thinning were associated with ipsilateral carotid symptoms in all the studies. However, the association between histologically identified plaque hemorrhage and lipid-rich necrotic core with symptoms was less clear in the study by Golledge et al. Intraplaque hemorrhage was equally common in symptomatic and asymptomatic patients (48% versus 50%) with severe stenosis requiring CEA, and no significant differences in the presence or size of the lipid-rich necrotic core between symptomatic and asymptomatic patients were noted in 6 of the 7 studies. In a more recent and larger systematic review of 31 observational studies, Gao et al7 again noted the lack of correlation of intraplaque hemorrhage with symptoms in large, recent, or high-quality studies. While these reviews of CEA histology confirm that some plaque features are associated with symptoms, there is a clear gap in the histology-based literature in patients with <70% stenosis who do not undergo surgery. Thus, the importance of plaque characteristics and symptom history in patients with mild/moderate stenosis is unknown. MR imaging of carotid plaque in patients with mild/moderate and severe stenosis could help fill this gap in the histologic literature. The advent of vessel wall imaging for the in vivo evaluation of atherosclerotic disease, particularly carotid atherosclerotic disease, has shifted the focus toward the preoperative evaluation of plaque composition that may identify unstable lesions.8–13 Direct in vivo 3T MR imaging of carotid plaque may be useful in identifying patients with an increased risk of ipsilateral thromboembolic symptoms. Carotid plaque MR imaging may be particularly helpful in symptomatic or asymptomatic patients with <70% carotid stenosis for whom there is a lack of histologic studies of carotid plaque as well as a lack of consensus agreement on the optimal treatment strategy. CE-MRA can demonstrate the degree of carotid stenosis compared with digital subtraction angiography, especially when care is taken to maintain submillimeter in-plane resolution.14,15 Recent work has demonstrated that ultra-high-resolution carotid CE-MRA on the order of 0.28 mm3 is possible with dedicated carotid surface coils on a 3T MR imaging scanner.16 Ultra-high-resolution carotid CE-MRA may depict luminal changes related to underlying plaque pathology that are associated with symptoms. 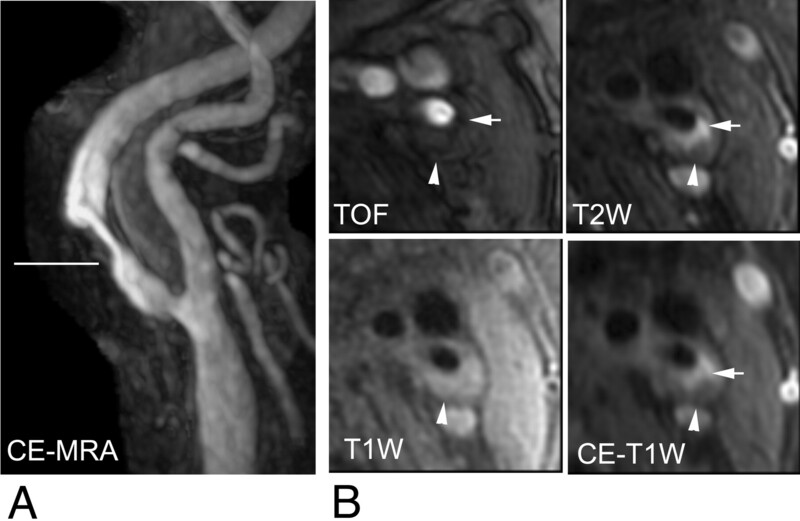 The purpose of this study was to identify atherosclerotic plaque features on high-spatial-resolution carotid 3T MR imaging and CE-MRA associated with recent ipsilateral carotid thromboembolic symptoms that may represent unstable plaque in patients with mild/moderate (30%–69%) carotid stenosis. In addition, we wanted to test the hypothesis that plaque features associated with symptoms may differ between patients with mild/moderate versus severe (70%–99%) carotid stenosis. Our study was compliant with the Health Insurance Portability and Accountability Act and was approved by the local institutional review board. Consent forms signed by patients at the time of imaging allowed retrospective analysis of patient studies and data. Bracco Diagnostic, which provided some grant support for this project, had no input into the formulation of this article. Between August 2005 and March 2007, 97 consecutive patients, under the care of the referring vascular surgeon or stroke neurologist, with carotid artery stenosis of 50%–99% involving 1 or both carotid bifurcations identified with noninvasive imaging such as duplex sonography or CT angiography, underwent carotid MR imaging. Of the 97 patients, 13 were neurologically symptomatic with a history of TIA, amaurosis fugax, or stroke appropriate to the distribution of the carotid artery within the past 4 months as confirmed by the referring vascular surgeon with >20 years of clinical experience or the referring stroke neurologist with >10 years of clinical experience. Other possible etiologies of thromboembolic disease were excluded from the study. These cases were identified by the referring vascular surgeon and stroke neurologists following work-up with an electrocardiogram and transthoracic echocardiography. If a patent foramen ovale was detected, additional lower extremity duplex sonography to exclude deep venous thrombosis was performed. Additional telemetry and transesophageal echocardiography were performed in patients in whom there was a high clinical suspicion of thromboembolic cardiac disease. Patients with other possible etiologies of thromboembolic disease who were identified by the vascular surgeon or stroke neurologist were excluded before imaging. The remaining 84 patients were asymptomatic. Clinical information was obtained through patient interview and supplemented with a chart review. Patients were imaged with a 3T whole-body MR imaging scanner and a research 4-channel phased-array surface coil.17 The artery selected for imaging, termed the “index artery,” was determined by symptom status. The symptomatic carotid artery with 50%–99% stenosis or the most stenotic asymptomatic carotid artery as previously determined by duplex sonography or CT angiography was chosen as the index vessel to be analyzed. MR images with 4 different types of contrast were obtained, including 3D TOF images, quadruple inversion recovery precontrast T1WI, multisection double inversion T2WI, and quadruple inversion recovery CE-T1WI obtained 5 minutes after intravenous infusion of 0.15-mmol gadobenate dimegulamine per kilogram of body weight. A pair of experienced reviewers who were blinded to clinical information performed image review by using a previously described protocol.19 In brief, a pair of reviewers taken from a total pool of 7 reviewers, all with >1.5 years of experience in carotid plaque imaging and blinded to subject, time point, and site information, reviewed the MR images. Differing pairs of reviewers were chosen to evaluate each of the research carotid plaque studies. Each scan was read by these 2 reviewers to reach a consensus decision. An image-quality rating (4-point scale: 1 = poor, 4 = excellent) was assigned to all MR images before the review. For images with image-quality scores of ≥2, image-analysis software (CASCADE18,22) was used to draw the lumen and outer wall boundaries. The arterial wall area was recorded along with various plaque features, including lipid-rich necrotic core, calcification, and hemorrhage, determined according to previously published criteria that have been validated with histology18,22 based on relative tissue signal intensities on TOF, T1WI, T2WI, and CE-T1WI compared with the adjacent sternocleidomastoid muscle. Details of the criteria are as follows: Lipid-rich necrotic core without hemorrhage is isointense on TOF images and T1WI, hypointense on CE-T1WI, and hypointense on T2WI; calcification shows hypointensity on all the image weightings; and hemorrhage appears hyperintense on TOF images and T1WI and can be hypointense to hyperintense on T2WI. In sections with a lipid-rich necrotic core, fibrous cap status (intact thick, intact thin, or disrupted cap) was evaluated on the basis of previously published criteria.22,23 Intact thick fibrous caps showed a uniform dark band adjacent to the lumen on TOF, an enhanced band adjacent to the lumen on CE-T1WI, and a smooth luminal surface on all the images. Intact thin caps showed no visible dark band adjacent to the lumen on TOF, no visible enhanced band adjacent to the lumen on CE-T1WI, and a smooth luminal surface on all the images. Ruptured fibrous cap showed a disrupted dark band or no visible dark band adjacent to the lumen on TOF, an irregular luminal surface on all the images, and a hyperintense area adjacent to the lumen on TOF images. An image-analysis software package24 was used to record measurements of the lumen area, wall area, wall thickness, and the area of tissue components when present.10,18,25 For plaque composition, the proportion of wall volume occupied by that feature was calculated for each artery (percentage volume). This calculation normalizes compositional features to the vessel size to account for innate differences in arterial size between subjects. Last, 2 experienced reviewers who were blinded to clinical outcome and carotid plaque findings reviewed all MRAs. A consensus decision was reached for the presence or absence of an ulcerated lumen based on previously published standards.26 The measurement of percentage diameter carotid stenosis was based on the NASCET criteria from the high-resolution carotid CE-MRA on multiplanar reformations generated by using a 3D stand-alone workstation.27 For this study, severe stenosis was defined, by using NASCET criteria, as a percentage diameter stenosis between 70% and 99% on CE-MRA. When the percentage diameter stenosis measured 30%–69% on the CE-MRA, the patient was categorized as having a mild-to-moderate stenosis. Each patient contributed only 1 set of observations (ie, the index carotid artery) to the dataset for analysis. All the categoric and continuous features were analyzed on an artery/patient basis. For each continuous metric of MR imaging−identified plaque components, the percentage volume from each artery was analyzed. The minimal lumen area and the maximal wall thickness were also used during data analysis. Descriptive statistics are presented as mean ± SD for continuous variables and as numbers of cases and percentages for categoric variables. Prevalence and size of plaque features were compared between patients with mild/moderate and severe carotid stenosis by using either a χ2 test for categoric variables or a Student t test for continuous variables. The magnitude of the association between carotid artery characteristics as identified by MR imaging and recent cerebrovascular symptoms was determined separately for the mild/moderate and severe stenosis groups by using univariate logistic regression. Results from logistic regression analysis are reported as an OR with a 95% CI. 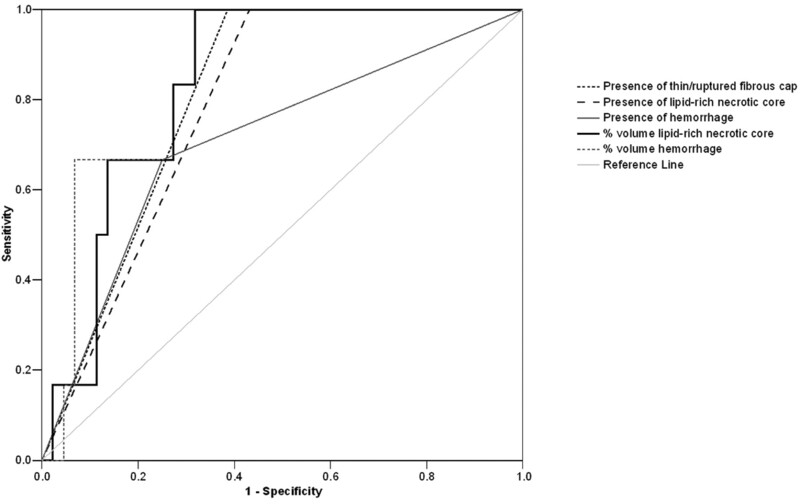 We used exact logistic methods to calculate the lower limit of the 95% CI for the OR as well as the Fisher exact test to determine the statistical significance of the associations between recent symptoms and the presence or absence of plaque characteristics in the presence of zero values. All analyses were performed with the Statistical Package for the Social Sciences, Version 16 (SPSS, Chicago, Illinois), except for the exact models, which were performed by using SAS, Version 9.1 (SAS Institute, Cary, North Carolina). P < .05 was used to designate statistical significance. Accuracy to classify symptom status for each statistically significant metric selected in the logistic regression analysis was assessed with ROC, and the AUC was evaluated. Among the 97 patients (97 arteries), 90 (92.8%) arteries had sufficient image quality for plaque interpretation. None of the symptomatic subjects were excluded. Accordingly, 77 asymptomatic and 13 symptomatic arteries were analyzed. The 90 arteries yielded 1451 sections available for image review. Seventy-eight (5.4%) of 1451 interpreted sections required mutual discussion for consensus agreement. The presence of clinical cardiovascular risk factors did not correlate with symptom status (Table 2). Although all patients in this study had 50%–99% stenosis of the index carotid artery as detected by entry duplex sonography or CT angiography, the high-resolution research carotid CE-MRA revealed a wider range of stenoses. On the basis of the high-resolution research CE-MRA, 50 patients were classified as having mild/moderate carotid stenosis (Table 3). In these 50 patients with mild/moderate carotid stenosis, 6 were symptomatic with a mean percentage stenosis of 50.8 ± 6.9 and a range of 42%–62% as measured on the research high-resolution CE-MRA. There were 44 asymptomatic patients with mild/moderate stenosis with a mean percentage stenosis of 55.5 ± 9.7 and a range of 30%–69%. On the basis of high-resolution research CE-MRA, 40 patients were classified as having severe carotid stenosis (Table 4). Of the 40 patients with severe stenosis, 7 were symptomatic with a mean percentage stenosis of 86.3 ± 6.5 and a range of 79%–95% as measured on the research high-resolution CE-MRA. There were 33 severely stenotic asymptomatic patients with a mean percentage stenosis of 81.7 ± 6.9 and a range of 71%–99%. In 50 patients with mild/moderate stenosis as identified on the high-resolution carotid CE-MRA, the prevalence of each plaque and luminal surface characteristic was the following, respectively, in symptomatic and asymptomatic patients: 100% versus 39% (P = .006) for a thin/ruptured fibrous cap, 100% versus 43% (P = .022) for lipid-rich necrotic core, 67% versus 25% (P = .055) for hemorrhage, 67% versus 84% (P = .311) for calcification, and 50% versus 36% (P = .661) for the prevalence of MRA ulceration. All symptomatic patients had a lipid-rich necrotic core and a thin/ruptured cap (Table 3 and Figs 1 and 2). Univariate logistic regression models demonstrated that the presence of a thin/ruptured fibrous cap, the presence of a lipid-rich necrotic core, and the percentage volume of lipid-rich necrotic core were significantly associated with recent symptoms (Table 3). The presence and the percentage volume of intraplaque hemorrhage were marginally significantly associated with symptom status (Table 3). Accuracy to classify the symptom status of these 5 plaque components by using ROC demonstrated the largest AUC for the percentage volume increase of the lipid-rich necrotic core, followed by the presence of a thin or ruptured fibrous cap (Table 3 and Fig 3). All the other carotid plaque characteristics, CE-MRA stenosis as well as clinical variables, were not significantly associated with symptom status. Coronally acquired MRA and transverse images of a complicated carotid plaque of the left carotid artery from a 75-year-old man with right-sided weakness. A, Maximum intensity projection of CE-MRA demonstrates a 55% smooth stenosis at the left internal carotid artery. The horizontal line indicates the level of the transverse carotid plaque images (shown in B). B, Disrupted dark band (arrow) on the TOF angiogram and discontinuation of the high-intensity band on CE-T1WI indicate a thin fibrous cap. High intensity on TOF and precontrast T1WI indicate regions of hemorrhage (arrowhead). The low-intensity area on the CE-T1WI indicates a lipid-rich necrotic core area occupying 31% of the wall area (chevron). Notice that the hemorrhage seen on TOF and T1WI almost completely fills the lipid-rich necrotic core as seen on the CE-T1WI. Symptomatic plaques tend to have a hemorrhagic lipid-rich necrotic core with a thin or ruptured fibrous cap. Transverse carotid plaque images and coronally acquired CE-MRA of the left carotid artery from an asymptomatic 61-year-old woman. A, Maximum intensity projection of the CE-MRA demonstrates a 74% stenosis at the left internal carotid artery. The horizontal line indicates the level of the transverse carotid plaque images (shown in B). B, Transverse image of a TOF angiogram demonstrates a smooth luminal surface and a dark juxtaluminal band indicating an intact thick fibrous cap. The thick fibrous cap is easier to appreciate as a high-intensity band (arrow) on the CE-T1WI and the T2WI. An isointense area on TOF images and T1WI, an iso- to low-intensity area on the T2WI, and a low-intensity area on the CE-T1WI image indicate a lipid-rich necrotic core without hemorrhage occupying 29% of the wall area (arrowhead). Notice that the lipid-rich necrotic core is easiest to appreciate on the CE-T1WI. Asymptomatic plaques tend to have a smaller lipid-rich necrotic core without hemorrhage as well as a thick fibrous cap. Strength of the association ROC between carotid plaque features and ipsilateral symptoms for 50 patients with mild/moderate carotid stenosis measured by CE-MRA. In 40 patients with severe carotid stenosis, the prevalence of MRA ulceration was 86% for symptomatic patients and 36% (P = .039) for asymptomatic patients. The prevalence of thin/ruptured fibrous cap (57% versus 52%, P = .787), the prevalence of lipid-rich necrotic core (57% versus 64%, P = .748), the prevalence of hemorrhage (43% versus 36%, P = .748), and the prevalence of calcifications (86% versus 73%, P = .480) were similar in symptomatic versus asymptomatic patients with severe stenosis. Univariate logistic regression indicated that the presence of an ulcer detected by CE-MRA (OR, 10.5; 95% CI, 1.1–97.9, P = .039) was significantly associated with recent symptoms (Table 4). There were no other statistically significant findings between the other plaque characteristics and symptom status or between clinical risk factors and symptom status (Table 4). This study demonstrates a correlation of in vivo 3T MR plaque and lumen findings with recent symptoms in patients with mild/moderate versus severe carotid stenosis. The ability to noninvasively characterize carotid plaque on 3T MR imaging extends our knowledge of which distinctive wall features are associated with symptoms to include a patient population that does not meet established criteria for surgical resection. The preliminary results from this study suggest that there may be specific wall features that discriminate symptomatic from asymptomatic plaque in the cohort of people with mild/moderate stenosis as measured by CE-MRA, including: the presence of a thin or ruptured fibrous cap as well as the presence and size of a lipid-rich necrotic core. The presence and size of plaque hemorrhage demonstrate a tendency to be associated with recent symptoms. The quantitative analysis of the size of percentage volume lipid-rich necrotic core demonstrates the highest AUC in the ROC of the strength of association of plaque findings with recent ipsilateral carotid symptoms. These preliminary findings need to be confirmed in larger studies before the results can be applied to larger populations. If confirmed, in vivo 3T MR carotid plaque imaging may identify patients with mild/moderate stenosis who are at a higher risk of stroke or TIA from unstable plaque. There are limitations in spatial resolution with our current implementation of in vivo 3T carotid MR imaging. Using an in-plane resolution of 550–625 μm, we were able to demonstrate a significant association between the presence of a thin or ruptured fibrous cap in patients with mild/moderate stenosis and a history of recent ipsilateral carotid thromboembolic symptoms. Recent work has suggested that the minimal fibrous cap thickness associated with plaque rupture in the carotid artery is much larger than that in the coronary artery, perhaps due to differences in the caliber of the internal carotid artery and the coronary artery.29 In a recent histologic review of 526 carotid plaques removed from symptomatic patients with severe carotid stenosis, Redgrave et al29 concluded that a representative cap thickness of 500 μm or a minimum cap thickness <200 μm should be used as specific cut-points for discriminating ruptured and nonruptured plaques. The former criteria are within the resolution capabilities of current in vivo carotid MR imaging. In the future, it may be possible to use the higher signal intensity–to-noise ratio of 3T MR scanning to achieve higher spatial resolution to allow depiction of the minimal fibrous cap thickness. Histopathologic studies have demonstrated that plaque that has the potential to rupture is characterized by a large thrombogenic lipid core with thinning or rupture of the overlying fibrous cap.30 Takaya et al11 demonstrated that the development of new stroke or TIA was associated with larger lipid-rich necrotic core size in a prospective longitudinal study of 154 asymptomatic patients with 50%–79% carotid stenosis. Our study results are in agreement with those of Takaya et al in that the size of the lipid-rich necrotic core is associated with ipsilateral carotid symptoms in patients with moderate stenosis. Our study also demonstrated a significant correlation of recent symptoms with the presence of a lipid-rich necrotic core in patients with mild/moderate stenosis. Combined with the results from Takaya et al, our study would suggest that as the lipid-rich necrotic core increases in size, the plaque may become more unstable in patients with mild/moderate carotid stenosis. An important gap in the histologic literature exists because carotid specimens are not available for asymptomatic patients with <70% stenosis. The use of in vivo carotid plaque MR imaging to evaluate patients with moderate stenosis has been reported. Several MR imaging studies have demonstrated associations of intraplaque hemorrhage with neurologic symptoms in patients with moderate stenosis. In prospective studies of patients with 50%–79% carotid stenosis, hemorrhage as seen on multicontrast MR plaque imaging was related to subsequent ipsilateral carotid cerebrovascular events during follow-up.11 Multiple studies using inversion recovery T1WI magnetization-prepared rapid acquisition of gradient echo have demonstrated that recent or recurrent symptoms were associated with intraplaque hemorrhage on the baseline MR plaque imaging studies for patients with symptomatic moderate and high-grade carotid stenoses.8,31,32 Our current work supports these earlier studies by demonstrating a tendency for plaque hemorrhage to correlate with recent ipsilateral carotid symptoms in patients with mild/moderate carotid stenosis. Although the size of the current study does not support a multivariate analysis, the strength of associated ROC comparing the correlation of recent symptoms with plaque characteristics indicates that the AUC is largest for the percentage volume lipid-rich necrotic core followed by the presence of a thin or ruptured fibrous cap. These plaque components may be the most indicative of a “vulnerable” plaque. In this study, neither the lipid-rich necrotic core nor intraplaque hemorrhage was significantly associated with symptoms in patients with severe stenosis. This finding is consistent with the large number of histologic studies that have compared carotid plaques removed from symptomatic and asymptomatic patients in an attempt to understand the mechanisms underlying plaque “activation.” In recent summaries of the literature by Golledge et al6 and Gao et al,7 most of these histologic studies were unable to demonstrate a correlation between the depiction of a lipid-rich necrotic core or intraplaque hemorrhage and ipsilateral carotid symptoms in patients with carotid stenosis severe enough to warrant CEA. Despite the lack of correlation between histologic studies and symptoms, it is also possible that larger and more numerous in vivo MR imaging carotid plaque studies may consistently depict a correlation of symptoms with necrotic core or intraplaque hemorrhage in patients with severe carotid stenosis. For instance, Yamada et al32 did find an association of plaque hemorrhage and recent symptoms in patients with severe stenosis that just did reach significance (Fisher exact test, P = .0498). There are 2 limitations to this study. First, this cross-sectional study is a retrospective comparison of in vivo 3T MR carotid plaque imaging characteristics of patients with recent ipsilateral thromboembolic symptoms. A larger prospective study is needed to evaluate whether carotid plaque characteristics that are associated with subsequent symptoms vary between mild/moderate and severe stenoses. Second, the number of symptomatic patients was too small to support extrapolation of these preliminary findings to larger patient populations or support a multivariate analysis. However, the multiple carotid plaque characteristics that were individually observed to be significantly associated with recent symptoms in patients with mild/moderate carotid stenosis suggest that future prospective studies correlating vessel wall MR imaging with the development of thromboembolic events should include the ability to identify the presence and size of the lipid-rich necrotic core, the presence of a thin or ruptured fibrous cap, and the presence and size of intraplaque hemorrhage. This in vivo 3T MR imaging of patients demonstrates several plaque components that are correlated with recent ipsilateral carotid thromboembolic symptoms. These preliminary results also suggest that the associations between plaque characteristics and symptoms may vary by degree of stenosis. If confirmed in larger studies, carotid MR imaging may distinguish stable from unstable lesions, particularly in individuals with mild/moderate carotid stenosis in whom the role of surgical intervention is currently unclear. We thank our research technologists, Colleen A. Hammond and Scarlett R. Doyle, for their help in acquiring the MR images. This work was supported by the American Heart Association Midwest Affiliate Grant-in-Aid 0855604G; Michigan State University/Office of Vice-President for Research & Graduate Studies and the Office of the Provost through the Internal Grant Program 05-IRGP-472; Bracco Diagnostic Inc; Extramural Research grant I021764; and National Institutes of Health grant HL56874. Paper previously presented in part at: 17th Scientific Meeting of the International Society for Magnetic Resonance in Medicine, April 18–24, 2009; Honolulu, Hawaii.